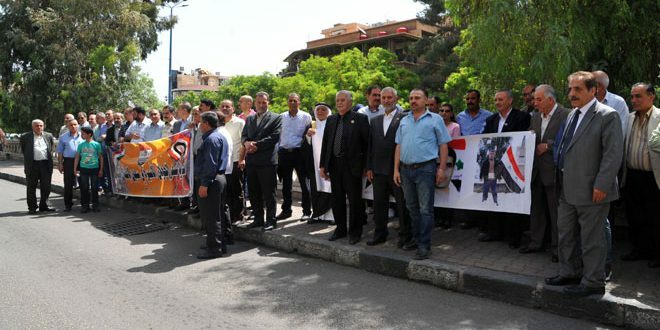 Damascus, SANA- Marking the Syrian Prisoner Day on April 21st , the Syrian Committee for Supporting the Syrian Detainees and Freed Prisoners in Israeli Jails organized on Thursday a sit-in in front of the International Committee of the Red Cross (ICRC) headquarters in Damascus. 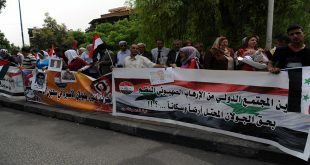 In a letter handed to ICRC representative, participants called on the humanitarian and rights organizations to shoulder their responsibilities, and consider the arbitrary and inhuman acts practiced on the Syrian detainees by the Israeli occupation authorities. They called for pressure to be put on the Israeli occupation authorities to fulfill the captives’ demands and release the captive Sudqi al-Maqt and his Syrian fellow inmates. Head of the Committee Ali al-Younes clarified that the sit-in is a confirmation of solidarity with detainees in the Zionist prisons and rejection of the violations practiced upon them by the occupation authorities. About one-fifth of the occupied Syrian Golan’s population have been arrested and prosecuted by the Israeli occupation forces. Many of the prisoners are still in arbitrary detention. Women, children and the elderly have been detained without trial.